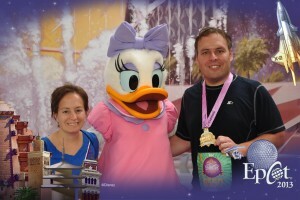 Picking up where we left off at the end of Part One (http://casual-runner.com/2014-08-12-race-review-2013-rundisney-princess-half-marathon/) of this Review…. 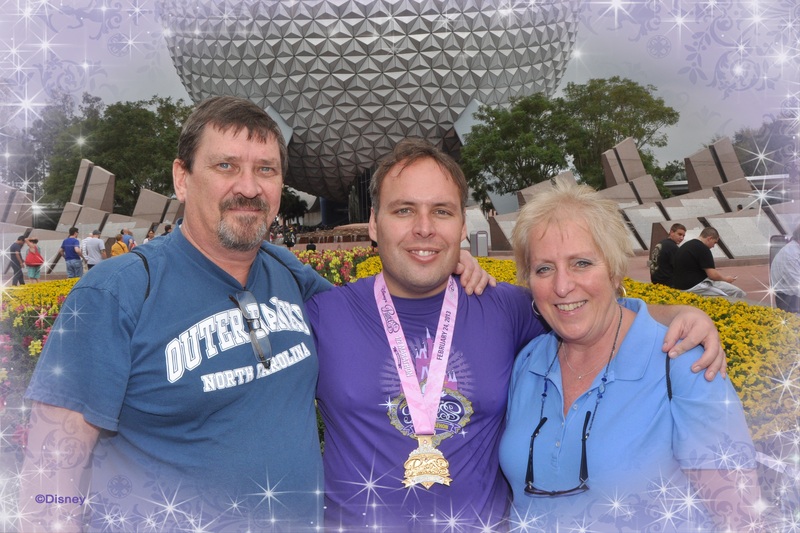 My brother and I started in Corral C, which surprised me because I am not a fast runner, but that is where RunDisney placed us based on our times, and I ended up being faster than most of the runners around me. The first part of the race is on Epcot Center Drive, which is a 2-lane highway, and it was very congested. It was so congested that I spent the first mile and a half running on the shoulder of the road and the nearby grass area. Easter Egg.There is not much crowd support at this part of the race (except for the very beginning), so when we made the sweeping right turn onto World Drive, we saw the RunDisney-placed Cheer Squads and – more importantly – the monorail racing alongside of us, my heart started to race. It is the little things in races that get you excited, running alongside of a monorail is a big one. We next passed through the Magic Kingdom toll booth which was glowing with theatrical lighting. 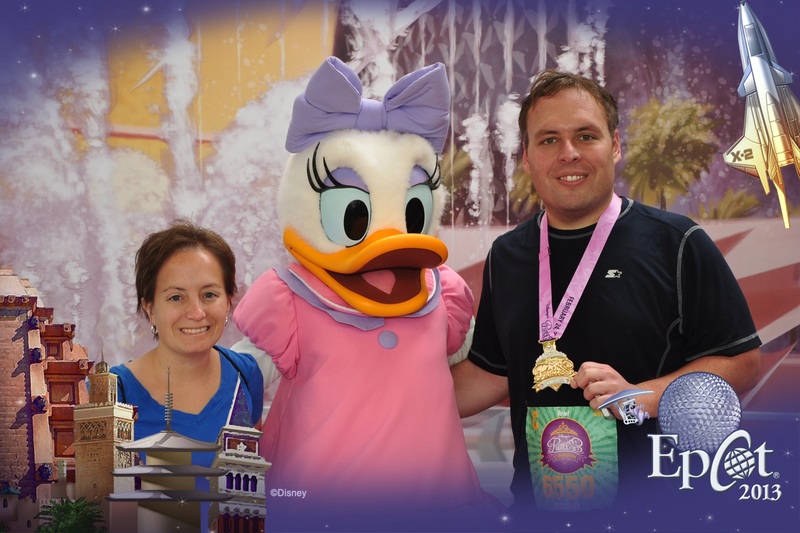 RunDisney does a good job of adding character photo opportunities and set pieces along otherwise desolate stretches of the course, which is entertaining even if you do not stop – which I did not. Easter Egg. While I had studied the course and knew the Walt Disney World property well, I did not expect the arrival at the Ticket and Transportation Center (TTC) to be magical, but it was. While it was still dark, we rounded a turn in the parking lot and all of a sudden came upon a long snaking line of spectators, standing two and three deep, cheering us on. I had never experienced anything like this. I had never been cheered on before at anything other than a Little League baseball game. But these people were magical in their own right. Full throated cheers in the early morning hours for people they did not know. This was pure excitement. This was racing. After leaving TTC we passed the Contemporary Resort and traveled under the water bridge, which is very cool, though I am guessing many of the runners did not know it was any different than any other overpass. Then we saw it, Cinderella’s Castle. Only a few more turns until the payoff: our entrance into the Magic Kingdom. A rare shot of me mid-race, and I almost did not make it into the frame. Unexpected Magic. The course designer earned his money when he designed this part of the route. We snaked around cast member service routes as we passed under the monorail beams. We then entered the Magic Kingdom – not through the main gates, but through a side cast member entrance into a backstage area where a water station was placed. Now, for the first 5 miles of the race, everyone around me was talking, encouraging one another, and singing along to the on-course music. However, when we entered the backstage area, everyone fell silent. It was reverent. The Disney fans appreciated where they were and where they were about to be. The only sounds were of the volunteers serving water. It was a pretty surreal experience. Race Icon. The solemnity of the backstage area abruptly ended when we burst into Town Square, where thousands of cheering fans were packed-in 10-15 people deep. For me to be running my first half marathon in a place that was so important to me growing up is indescribable in words. I had to fight back the tears. As I turned right onto Main Street USA, I saw a sea of people cheering us on all the way to the Hub, and there it was: Cinderella’s Castle. I had seen it hundreds of times before, but never like this. This time, was, truly special. We turned right, leaving the crowds behind us and made our way through the otherwise-empty Magic Kingdom – first into Tomorrowland, past the speedway, and into the newly-opened New Fantasyland. Mickey Mouse and Minnie Mouse, in all of their royal regalia welcomed us for the entrance into the Castle. Race Icon. This is the moment why you run this race: to run into, through, and out of Cinderella’s Castle, emerging into the forecourt area, seeing the sea of supporters, volunteers, and runners filling the Hub, Main Street USA, and Town Square, with the Disney World Train Station at the far end. It was an amazing site to behold, even if only for a fleeting moment. Next there was a sharp right turn into Liberty Square, then to Frontierland, and out a side entrance flanked by one of the Walt Disney World steam trains. 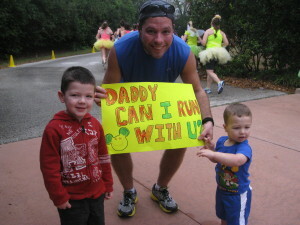 My brother, Frank, stopping in the middle of the race to celebrate with two future Casual Runners. For me, this is where the race started to drag. Miles 6.5 to 9.5 were a challenge. This stretch was run on congested back roads passing the Grand Floridian and Polynesian Resorts. It was also my first introduction to “cone alley,” which admittedly is a cool site (say hi to Bob’s Barricades as you run past). RunDisney is limited by the infrastructure in this area, but it did get congested, which was made worse by the rising sun (running in the dark just seemed way cooler – oops, sorry, no pun intended) and coming down off of the emotional high from the Magic Kingdom. There are very few viewing opportunities for spectators on this stretch of the course, so you have to just trust your conditioning and training and, hold on until you get to Epcot. Anyone who runs a RunDisney race knows that the costumes runners wear are awesome. I may not participate in this tradition, but I can certainly enjoy the efforts of my fellow runners. Back around mile 2.5, I was passed by a runner wearing an impeccable Princess Leia costume – she had the trademark hair buns, a full length, long sleeved white gown, and a utility belt complete with a laser gun and light saber (but I don’t remember Princess Leia having a light saber?). She smoked me. She was flying. At mile 9, I was struggling a bit, and who do I see? But Princess Leia. She had ditched the utility belt and weapons. Her hair was falling down out of the buns and she was fighting with her dress, which was covered in sweat and clinging in a way that she did not want it to. I felt bad for her as she struggled. But let this serve as a lesson, even the best looking and themed costumes must still allow you to run your race. There was only one “bad” part of the course, and it is most likely unavoidable. Right at mile 10, in order to transfer runners from World Drive back onto Epcot Center Drive, the course takes a right turn up a highway on-ramp. What makes this challenging is that it is also steeply banked. This took a toll on my ankles. My advice is to get to the very top or very bottom of the embankment and do not stop, just keep pushing through, it will be over soon. Props go to RunDisney for placing the Army Men from Toy Story on this part of the course to offer playful encouragement. Another odd part of the course is that somewhere around mile 11 they had us do a weird 180-turn. I did not understand it, and admittedly 180’s are not fun for me as I feel that they kill all of my momentum. A little post-race celebration with my parents. My mom was the one who instilled my love of all things Disney at early age, so I have her to blame, er, I mean, thank! We came up over another overpass and saw it – Spaceship Earth. It beckoned us towards Epcot, where we knew the finish line is. It was a sight to behold, aglow in the early morning sunrise. As we approached the Epcot transportation area, fueled purely on adrenaline, we started to see our first spectators in miles, and I fed off of their energy. Unexpected Magic. In trying to be respectful of my family, I did not want them to waste their precious vacation time by waking up early and traipsing around a half marathon course. As such, we did not plan a where or a when that they could see me on the course. So I did not see them, nor did I expect to see them. But then, right at mile 12, before entering the backstage area of Epcot, when I needed their support the most, I saw sitting along the side of the road my family – my mother, stepfather, brother-in-law, sister-in-law, and two nephews – cheering wildly for me. There was a renewed pep in my step and I was filled with a new sense of commitment and purpose. They tried to hug me but I waved them off and apologized as I went by – I knew that if I stopped there was no way I would be able to resume running again. (I later learned that earlier my brother stopped to hug his boys and take photos. I know, he’s just better, and I am sure that he would tell you that as well – you can see all of this in our YouTube video at the end of this piece). We entered Epcot via a backstage area by the Living Seas Pavilion (I know it is now called the Seas with Nemo and Friends, or something like that, but it will always be the Living Seas to me), and then entered the onstage areas of the park, which were packed with screaming supporters. Ever since I was a little boy I’ve loved Epcot, one of the few kids who loved it almost as much as the Magic Kingdom, so I was stoked to be running in this part of the park. We ran past Spaceship Earth and out past the fountains towards the World Showcase. I wish the course designers could find a way to have the course go around the World Showcase Lagoon as the marathon course does, but instead we did a 180 degree turn at the entrance to World Showcase to return to the front of the park. There was much more room to make this turn than the last one, so it really was not bad at all. Race Icon. There is no better sight of Spaceship Earth than coming from World Showcase in the early morning, seeing it set against a perfectly blue sky, and knowing that your race is nearly complete. We passed along the base of it to the right and then out into yet another offstage area. Unexpected Magic. In this area, hidden from view from the spectators, a crowd of off-duty cast members were gathered to cheer us on and, to my surprise, join in the singing of a large gospel choir who were willing us to finish the race. It worked. My sister and I celebrating with one of the Disney Princesses. Emerging from the off-stage area we were sent directly into the finishers’ chute. Grandstands were set up and they were packed with cheering fans. I later learned that my family had moved over to this area and were cheering for me, but I did not see them, I did not see or notice anyone, I was focused on one goal: the finish line. 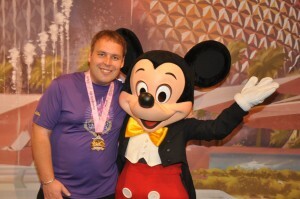 Standing in front of the finish line was my childhood hero, Mickey Mouse himself. He stood there waiting to high-four me, and I gladly obliged only a moment before I crossed the finish line. I did it. I completed my first half marathon. There was no reason to hold back the tears now. I set a goal and I achieved it. Having that medal placed around my neck was like no feeling of accomplishment I had ever experienced. I did it. Now it was time to enjoy myself. RunDisney tends to up its game when it comes to designing medals for anniversary races, and since this was the 5th anniversary of the Princess Half Marathon, they did not disappoint. Ok, I will admit, this was not the most “manly” medal I could have received for my first ever half marathon medal, but it is still pretty darn cool. As the vast majority of runners are women, the tiara is a perfect fit for the race theme and target audience. I really like it though as I can appreciate it as a work of art. RunDisney does not cheap out on the medals, and everything from the design, the quality of the materials used in the metal, and the quality of the ribbon are exceptional. Of course I had to get a celebratory picture with the big Mouse himself. The thought of taking this very picture helped provide the motivation to endure several cold training sessions during the Ohio winter. After the race I did not want to take off my medal, I earned it and I was going to wear it proudly. Without even knowing that it was “a thing” at RunDisney events, I wore my medal to the park after the race (you may even see one or two pics in the YouTube video). To my pleasant surprise, all of the other runners I encountered in the park that day were likewise proudly wearing their medals. The few who chose not to do so told us that they wished that they had worn theirs. Unexpected Magic. 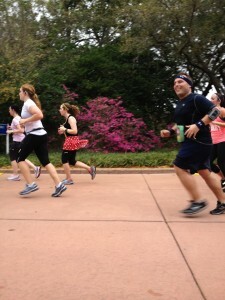 Most Disney cast members and fellow runners were quick to offer their congratulations and asked how the race went. There was genuine excitement and encouragement in this, and it was a great bonus to my first half marathon experience. I would later learn that this is standard for every RunDisney race, and it is a practice that I whole-heartedly endorse and support. You’ve earned the right to enjoy it, and no one does it better than Disney. The post-race area was well-done. It was extremely well-organized, and the volunteers were helpful, courteous, and on the ball. They kept everyone moving without making you feel as though you were being rushed. Water and Powerade were there in abundance and I immediately started on the task of re-hydrating. One last picture with me, my SMO, and my Disney princess. Walt Disney World really is where dreams come true. The biggest disappointment was the post-race food options. RunDisney insists on giving out pre-packaged snack boxes and a half of a banana. Why only half of a banana? The contents of the boxes were not at all appealing to me after having run a half marathon. While I cannot remember the exact make-up of the selection, I believe it included some multi-grain crackers, hummus, and a Luna bar. I was disappointed with this selection and was soon off in search of some real sustenance. I was not prepared for the amount of walking that came next. Remember the walk from the busses to the pre-race area from earlier in the morning? We now had to walk it in reverse. To make matters worse, because the parking lot was so packed with runners, spectators, and day guests to Epcot, the cell towers were overwhelmed and I could not get cell coverage to get in touch with my family. 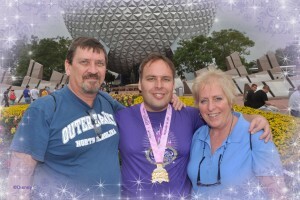 I slowly (I was doing a bit of hobbling) made my way to the entrance of Epcot where we all finally met up. My brother had claimed our gear check bag and we entered the park where I changed clothes, cleaned up a bit, and then participated in the greatest post-race tradition ever: I road Soarin. If you have been to Walt Disney World (or Disneyland), you know that Soarin is a great attraction. But it is made all the better by riding it after completing a half marathon. And yes, I rode Soarin wearing my medal, there was no way that SMO was coming off. Even though the race “picked me,” I think that I pretty much picked the perfect race for my first half marathon. The course was not overly-challenging, the on-course entertainment and scenery were great, and the Disney “magic” gave me the extra bit of motivation to rise to the occasion at a distance that, even in the week leading up to race day, I still had my doubts as to whether I could make it. I cannot say enough about how tremendous the volunteers were, especially in the water and food stations that were efficient and ensured that we were well-fueled for the race. While RunDisney races are more expensive than races of comparable distances, and are necessarily only done as a part of a runcation for most people, this certainly made for a memorable – and emotional – first half marathon. One more thing. When I returned home and checked the race results, I noticed that, while I had times for all of my splits, I did not have an official chip time. This was because, for whatever reason, my bib did not record when I crossed the start line. I called the good folks at RunDisney and told them that my brother and I started together and that we should have the same start time. I gave them his bib number and they promised to check the video and get back to me. They did so, but when the cast member called me back, she was laughing. She commented that I appeared to be in “quite a hurry,” as the video showed me darting off towards the woods as soon as I started. I am pretty sure she knew why (If you need to refresh your recollection, check out the end of Part One of this review: (http://casual-runner.com/2014-08-12-race-review-2013-rundisney-princess-half-marathon/). So Jennifer and I love RunDisney events, which means this is just the first installment of what will be a lot more coverage of RunDisney events on both coasts. To make sure you do not miss any of this coverage, be sure to like our Facebook page and follow us on Twitter. Also, we want to hear from you. 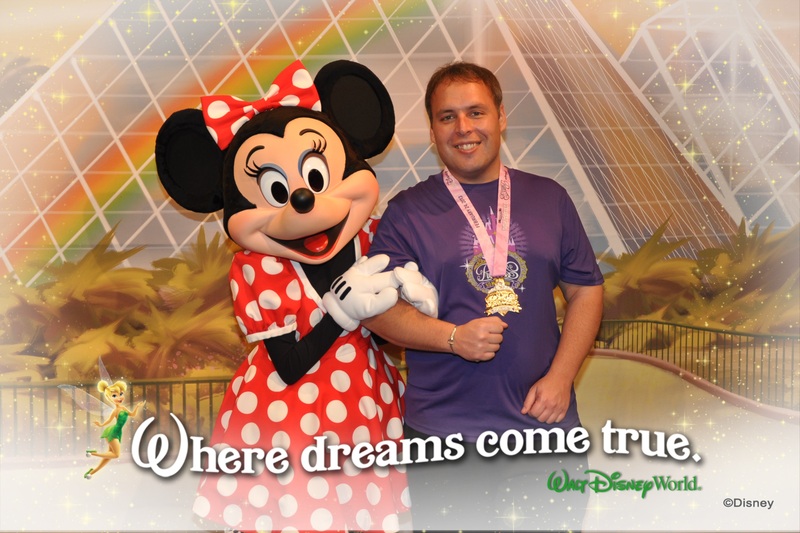 You can share any comments you have about my experience or your own RunDisney experiences in the comments section below, or by contacting us via email, Facebook, or Twitter using the links below.